CINCINNATI - Kimetta Carter has lived at Alms Hill Apartments for a decade, through three owners, four management companies, several lawsuits and empty promises to fix the deteriorating old building. But the worst may finally be over for Carter and more than 600 others who live at the Alms or six other low-income housing complexes in Cincinnati. Hamilton County Common Pleas Judge Curt Hartman ruled on Tuesday that the seven properties will be sold to new owners who have promised to make repairs and retain them as affordable housing. This finally puts an end to a long fight by city leaders, federal housing officials and residents for safe, clean and crime-free affordable housing in Cincinnati. "We're absolutely thrilled," Carter said. "Finally we are going to get the relief and renovations we need." It has been an especially troubling few years for the 126 families who live at the Alms, who are overwhelmingly African-American and many of whom are elderly or disabled. They worried a new owner would convert the building into expensive condos because of its valuable Walnut Hills location. But Hartman approved the properties’ sale on Tuesday to two of the nation’s largest affordable housing developers, assuring that all 661 units in Cincinnati will stay as low income. Smitherman and Hartman toured the Alms last year, in order to see the condition of the sprawling former luxury hotel on Victory Parkway. After years of neglect, the once grand building had fallen into terrible disrepair. The city sued the owner of the Alms in 2015 over the deplorable conditions there. As part of that lawsuit, the Alms and seven other Ohio properties owned by New Jersey-based PE Holdings LLC will now be sold. The Alms Hill Apartments in Walnut Hills is home to 126 families, mostly African Americans, and also many elderly and disabled residents. After a nationwide search, court-appointed receiver Jodi Ridings of Milhuas Management got 14 bids to buy the properties. Milhaus selected two out-of-state base buyers – Related Affordable LLC and American Community Developers. Both own hundreds of low-income units nationwide, according to court filings. American Community Developers will buy Shelton Gardens and Reids Valley, both in Cincinnati, as well as a complex in Lima and its property, for $9.4 million. Related Afforable will buy Entowne Manor, Georgia Morris, Founders Home, Burton and the Alms for $7.2 million. "We’re very happy with the two purchasers coming in," said Nick DiNardo of Legal Aid Society of Greater Cincinnati, who represented the residents. "We've had discussions with them. We think they are preservation purchasers with plans to rehab the property." DiNardo worried the city, which already has a shortage of 40,000 affordable housing units, would lose several hundred more if the buildings were sold to new owners who wanted to renovate them into market rate units or condos. "As areas get developed, all the low income people get thrown out. We've seen that in other neighborhoods in the city," DiNardo said. "But I have to give credit where credit is due - the city and Walnut Hill leaders have been very supportive of us." Mayor John Cranley signed a resolution last week, which won unanimous approval of Cincinnati City Council, supporting the sale of the apartment complexes because the units would be renovated and remain affordable. And two years later, in 2015, conditions at five apartment complexes got so bad that the city sued PE Holdings for unfit living conditions and public nuisance. 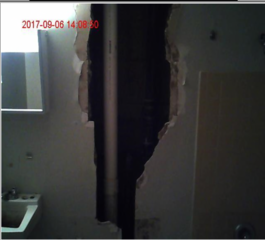 HUD inspected 24 units at the Alms, including 5 vacant, during their inspection on Sept. 7 and 8, 2017, and found 51 health and safety violations, including this exposed pipe. Problems ranged from lack of hot water and heat to broken sewer lines and a roof collapse that forced dozens of residents temporarily from their homes. A judge ruled the owner in mortgage default and put a court-appointed receiver in charge on Feb. 1, 2016. Conditions did improve. Passenger elevators were replaced, along with appliances, mailboxes, windows, screens and doors. Repairs were done to electrical systems, the roof and boiler, sewer lines, and apartment interiors. An August 2016 storm flooded the Alms’ boiler system under feet of sewage and water. Then a Jan. 28, 2017 fire prompted the need for immediate repairs and an upgrade of the faulty electrical system. This leaky ceiling was one of many violations discovered during a HUD inspection of the Alms in 2017. Long-term repairs got delayed and U.S. Department of Housing and Urban Development officials grew unhappy with the pace of the receiver’s work when they visited the Alms. After several failed inspections, HUD said in July 2017 that its Section 8 contract would be terminated after more than 30 years, and residents would be forced to move. But Alms residents fought back, filing a federal lawsuit against HUD, fearing they could become homeless if the agency ended low-income rental subsidies. Then in December HUD reversed course and decided to keep the Alms housing contract. Both sides agreed to drop the federal lawsuit. It was a small victory for tenants. But the bigger one came Tuesday. "We are looking forward to a bright, shining future," said Carter, who was just elected president of the Alms Residents Association. Carter has already spoken to the new owners about preserving the historic details of the old building and restoring the old Alms ballroom to its former glory. She's looking forward to all of the renovating all of the apartment units. "I'm almost without words, I'm so excited," Carter said. "This has been a long time coming."